For the fifth consecutive season, LaLiga has unveiled the former players who are set to work on the expansion of LaLiga’s international brand throughout the world. Samuel Eto’o, Carlos Valderrama, Julio Baptista, Aintzane Encinas, Luis Garcia and Xabi Prieto are the newest additions to this season’s #LaLigaAmbassadors squad, which was announced at a spectacular event. 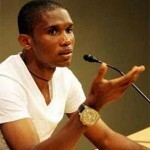 Continue reading Samuel Eto’o, Valderrama, Baptista, Encinas, Garcia, Prieto latest LaLiga ambassadors at Vanguard News.